“Irasshaimaseeee” reverberated in unison from behind the bar, greeting me as I inched my way past clusters of Japanese businessmen to the only available space I could spot. On this particular night, that happened to be at the end of the standing bar, right under the tiny flat screen that displayed the same peculiar speedboat-racing sport every single evening. I liked this spot, however, as it situated me straight across from the refrigerator, a very strategic positioning during my first several visits. Right as I entered the bar, Gan-san spotted me from the rear of the bar, adjusted his bandanna, as he regularly would, and pulled out a large bottle of Asahi from the cooler next to the fridge, ready to hand it over as I approached my spot. There were other drinks available…a standard brand of sake, whiskey and soda, and a few other concoctions that I never managed to figure out…but the 633 milliliter bottle of Asahi seemed to be the go-to for most of the clientele. And that it was for me as well. 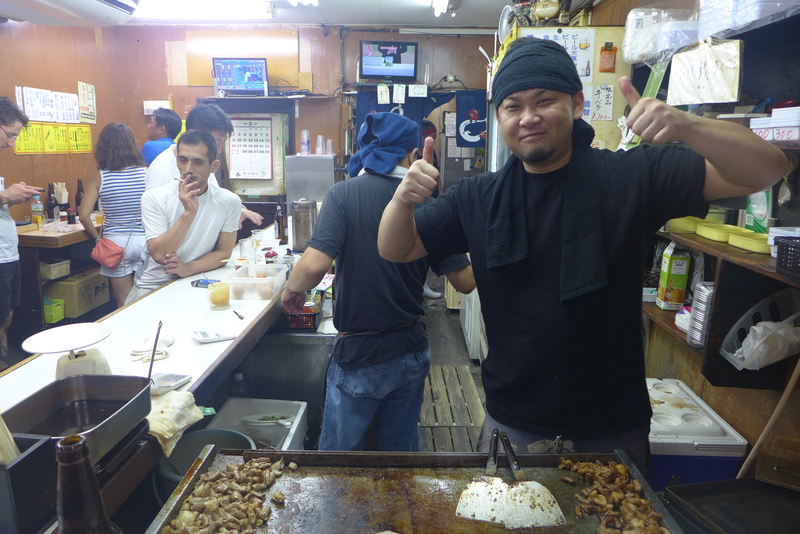 In his fifties, Gan-san was one of the older workers, and that night he took on the role of helper. And since Keisuke-san was manning the grill, that meant that Take-san would pop his head out from the back at any moment to resupply any sauces, ingredients or dishes that happened to be running low. This was the division of labor, and every night they would rotate. Now and then, one of the three would take a day off, and an old Japanese lady who I assumed was the owner would show up to help out. But otherwise, the set-up was pretty straightforward. The standing bar, although I’m more inclined to call it a shack, had a certain charm to it. Unlike most venues in Japan, this place didn’t seem to be the most presentable…accumulated, blackened grease would casually be scraped off of the flattop grill and dumped on the floor, wiring that protruded from the walls was carelessly taped together where the paint-chipped walls met the stained ceiling, the beef would be cooked right next to the pork intestines, mixing in the juices and, every now and then, being complimented by a free-floating chunk of liver…although reminiscent of many dining experiences in Southeast Asia, this was not the most common sighting in clean, structured, tidy Japan. It was impossible to miss if you happened to be walking anywhere within a square block in the Dōbutsuen-mae area of Osaka. Lingering like a magnetic cloud, those savory smells drew you in. Given my weakness for mouthwatering temptations and the fact that my closet hotel (as I now refer to it, as most of the rooms were roughly the same size as your average closet), the place I called my home for close to one month, happened to be conveniently located just 20 steps away, a visit was inevitable. Yet at first, I didn’t think it was going to happen. Every time I strolled by, the place would be packed with mostly middle-aged Japanese men…ties loosened, jackets off, briefcases hung underneath the counter…winding down after a long day at work. But apart from being crowded, the atmosphere was a bit intimidating. Similar to many local restaurants in Japan, most of the customers were regulars, the menu, if one even existed, was written only in Japanese, orders were shouted out (albeit politely), and most importantly, the workers were meticulously engrossed in preparing, cooking and serving. In short, it didn’t feel like the most welcoming place for a clueless foreigner who would inevitably instigate a serious of interactions in broken Japanese and confused pointing. Every time I left my closet, I would be greeted by the same, powerful burst of fragrances, with a richness that was difficult to ignore. And after a few days, the intimidation was slowly replaced by intrigue – what were they cooking that smelled so incredible? And how did such a battered joint attract such proper and loyal customers? There was only one way to find out. The boats were like sleek, motorized, diamond-shaped canoes. Each painted in a different, vibrant color, they would race around a circular track, the drivers hunched over as they drifted around floating buoys. The speed was impressive, and half of the bar was focused in on these whizzing powerboats. About a meter away, another screen was displaying a sumo competition that was taking place in Nagoya that day, seizing everyone else’s attention. A man with a blue and white bandanna wrapped around his head of thinning grey hair stood on the other side of the counter from me, pouring a serving of whiskey out of a gigantic, upside-down bottle which was secured to the wall. From the fridge, he took out a bottle of soda and poured the fizzing drink into the glass of whiskey. Some ice cubes. A quick stir. Ready. Passing the drink over the heads of the customers to someone at the rear counter, he quickly moved onto something else. For a few minutes, I just stood there watching, splitting my attention between him and the boat race, admiring his dedicated work while waiting for a moment to catch his attention. But he was completely in the zone. 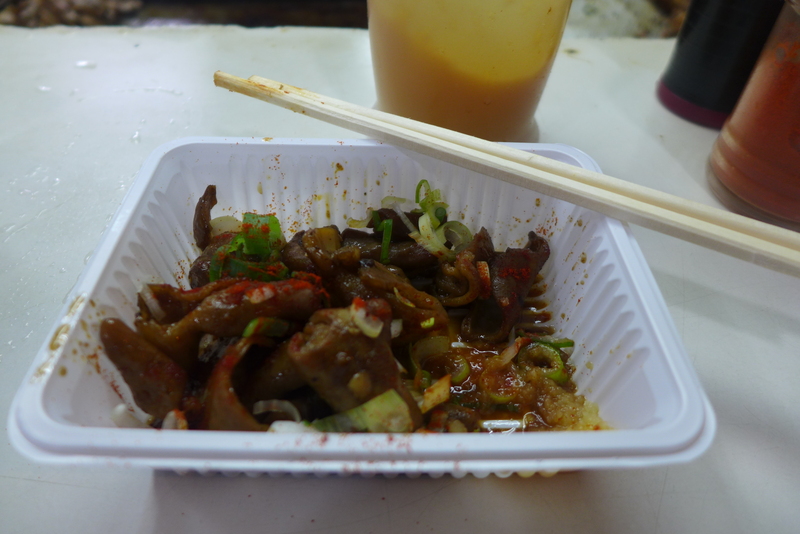 As he finished one drink, someone would shout something and he would grab an octopus salad from the fridge. 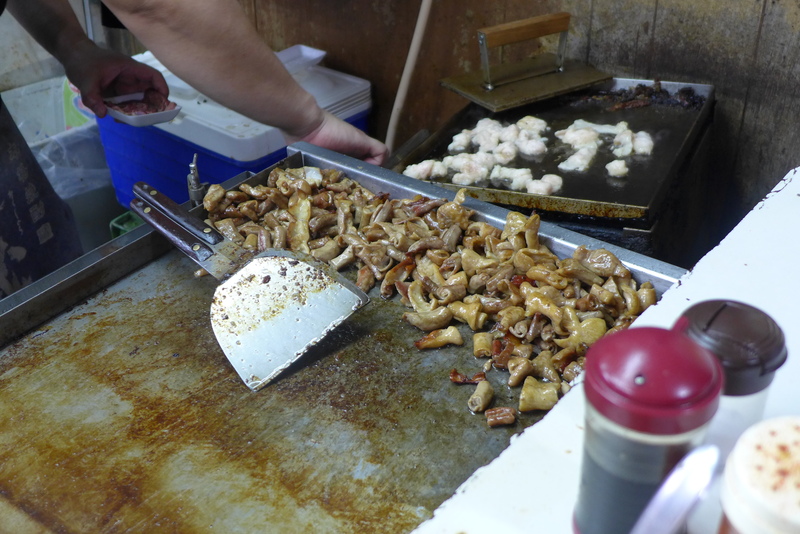 As he finished preparing the salad, a serving of fried tofu would be passed over from the grill. While decorating the plate of tofu with bonito flakes, three other orders would be rattled off. “Sumimasen!” I finally burst out. Upon catching his eye, I quickly pointed at the cooler with the beers, fearing that I would lose this opportunity if I waited too long. As he handed me the bottle, I took advantage of the situation and pointed at the pile of meat on the grill that never seemed to diminish. I didn’t know what it was, but everyone seemed to be ordering it, and I had a sneaking suspicion that that mound was the source of those smells. “Hai, horumon” he confirmed. I had successfully ordered my first dish, and simultaneously learned its name. Whatever I was eating, it was delicious..and over the course of the next several days, I kept coming back for more. But with each visit, I gradually expanded my horizons…and started getting the hang of things. I would walk in, order a beer, shout out an order of horumon, and then wait. Wait to see what others would order, watch it be prepared, and then, right as it passed over the counter, point at the white, plastic serving container and hope for the best. Using this method, I tried two to three new dishes each night, only relying on my best guess in determining what exactly I was putting into my mouth. But it didn’t matter at all, because each new dish I tried was more delicious than the last. So, instead of knowing the name or nature of the food in front of me, I memorized their locations in the fridge. And for about one week, my orders were characterized by an extended index finger towards the fridge – when I wanted the soft, fatty, white meat, I pointed to the bottom right corner; if it was the tough, marinated one, I’d point to the center-left; the potato salad was easy to spot on the top shelf, but there was a spicy, fishy dish hidden right behind it that was more difficult to point out, but worth the effort. Soon enough, the staff caught on to my eating trends, and only needed a nod in the general direction to know what I wanted, and how I wanted it prepared (salt based or with their special sauce). And then, Keisuke-san opened up. Always the most silent of the three, Keisuke-san was the youngest, yet most diligent worker. With his signature blue towel wrapped firmly around his head, he was constantly moving about, but never without a warm smile on his face. That day, I think he took all of us by surprise when he turned to me and asked “where are you from?” Until that moment, I assumed none of them spoke English, and never came across a customer that did either. Although I quickly realized Keisuke-san’s English was very limited, it opened up the door for dialogue, saving me from long periods of watching powerboat racing and the game of cat-and-mouse that would unfold each time I wanted to place an order. As a result, my evenings became more colorful as we began sharing our stories. But the more significant breakthrough was that I could finally ask questions. First and foremost, what was that ever-cooking, never-ending mound of meat on the grill top that kept everyone coming back for more? What was horumon, the name that kept this establishment running and running strong? Keisuke-san casually drew a box around his own belly with his fingers and stated “pig..intestine of pig.” And as I continued asking, I consistently received a similar response – a signal to the lower torso, “stomach…beef”; a grasp of the side, “muscle…sheep” ; a gesture downwards, “feet…chicken.” It seemed as if I was in innards-heaven. By my last week in Osaka, my Japanese lexicon had improved to the point of including every item on the menu and several useful dining phrases. It reached the point at which after rattling off a few of the strangest orders each night, customers standing around me would turn with a surprised gaze and start excitedly talking…to which I could only reply that I didn’t speak Japanese, in almost perfectly enunciated Japanese, adding further to the confusion. Fortunately, Keisuke-san would jump in to help out in these situations, by reiterating my story each and every time to a new set of curious ears. I’m still not sure what the place was called, but over the course of several weeks, this tiny standing bar presented me with many gifts – unparalleled dining experiences, a sense of community, and most importantly, a better and deeper understanding and experience of the local culture, with a chance to have a more meaningful role in it. And despite its appearance, I came to realize that the atmosphere, through the causal yet respectful interactions between the customers and staff, as well as the small and simple, yet rich and flavorful dishes, prepared with profound dedication and presented with meticulous care, truly embodied the beautiful subtleties of the Japanese culture. Forgetting to take my camera until the very last day, I only managed to snap off these three photos before the battery died, but the smells, sauces and smiles still linger vividly in my fondest memories.